Lionel Schriver's hugely successful novel "We Need To Talk About Kevin" is a powerful, intelligent and provocative novel about the mother of a boy who commits a high school massacre. The framing tool of the novel is that the mother, Eva, is writing letters to her husband, Franklyn, trying to explain what her life has become, and how she rationalises their part in raising a son who would commit such acts. From the earliest years we see the conflict between good-natured but naive Franklyn who wants two kids and a house in the suburbs, and Eva, the bohemian travel writer and City girl who has a deep antipathy to giving that up to raise children. And so we assume Franklyn and Eva are divorced. Eva describes the lack of bond she felt for Kevin as a child, his tantrums, her frustration, and Franklyn's disbelief that Kevin was actually playing psychological games with them. And then, when they have another child, sweet little Celia - so crucial because it shows that Eva can be a loving mother - they have their most powerful disagreement on Kevin's role in an "accident" with some bleach. The tension builds - we know the letters will take us through Kevin's adolescence to his gruesome act of murder, and we like Eva, want an explanation. But Schriver is far too subtle and realistic to give us easy answers. It's a stunningly well-written novel, and I can also highly recommend the unabridged audiobook read by Lorelei King - whose voice I thought was the definitive Eva. In approaching the material, writer-director Lynne Ramsay (MORVEN CALLAR) and writer (and actor) Rory Kinnear have taken a free approach - after all, one cannot easily translate an epistolary novel to screen, and the audience is likely familiar with the "big reveals" at the end of the novel by now. They keep the idea of the framing device - Eva in post-massacre life, bearing the insults and shame - and the chronological telling of Kevin's childhood. However, they begin with an almost impressionistic set of scenes giving us the atmosphere of the present and the past, hints at the suburban life that has been destroyed, and before that, of Eva's life of travel - all with a nightmare vividness. The screenplay is really a masterclass in how to translate a popular novel to screen, keeping all the thematic material in tact, but without being slavish. The performances are likewise superlative. Tilda Swinton really is as good as everyone says as Eva - depicting both the ambitious businesswoman and the broken, guilt-ridden mother. John C Reilly, who I couldn't really see as Franklyn before I watched the film, perfectly captures his naivete and frustrating blindness. But it's the two Kevin's who really stand out - Rock Duer as the young boy, and Ezra Miller as the teenager. The ability to go from pure evil, mocking stare to charming smile as the audience switches from Eva to Franklyn - truly superb and sadistic. On the technical side, DP Seamus McGarvey (ATONEMENT) does outstanding work, and Jonny Greenwood's score is wonderful. (THERE WILL BE BLOOD). But I had one massive problem with the direction, and that's the ham-fisted crude use of "blood" imagery - from Eva covered in crushed tomatoes; to over-filled jam sandwiches; to red paint thrown on a house; to Eva washing her hand's of aforementioned paint......Yes, we get it, there will be blood, and the blood, as for Lady Macbeth, will be hard to wash off, metaphorically speaking. But please, enough already. Where is the subtlety of Schriver in this blood-fetishism? << Ezra Miller (Kevin); Lynne Ramsay (Director) and Lionel Schriver (Author) at the UK premiere of WE NEED TO TALK ABOUT KEVIN at the BFI London Film Festival 2011. 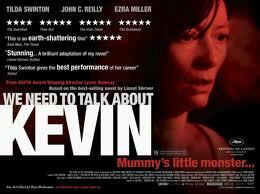 WE NEED TO TALK ABOUT KEVIN played Cannes, Toronto and London 2011. It opened in France earlier this month and opens in Ireland and the UK on October 21st. It opens in Greece and Hungary on November 3rd; in Australia on November 17th; in NYC and LA on December 9th and then on wide release in the USA on January 27th. It opens in Sweden on February 17th.